Today did not go to plan. 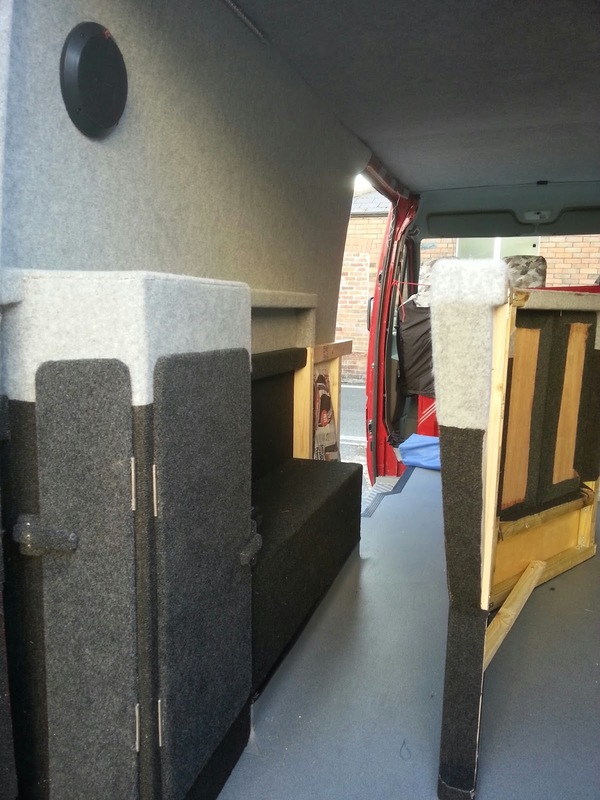 The plan was to fix the frame into the van and cut the ply for the bed. I need a second pair of hands for this due to the size of the sheet and only owning a jigsaw and a very cheap workbench that I do not really trust. My able assistant does not rise until early afternoon so I decided to crack on finishing off the rear cupboard. I started that at 7.30am and just about finished it at 2pm. I really do not know where the time went, well I do.......Bloody fittings not working as planned. In the old van I used roller catches and they worked well, never popped open and were easy to use, they were attached to vinyl covered ply. I tried my best to get them to work with this build but the difference is that I have covered it with thick Veltrim carpet. This stuff if very luxurious but a pain in the arse for the cupboards. Second option was to use a lever type latch, I could not get these spaced correctly either and they just sprang open all the time due to the 'springiness' of the carpet. About to resort to some bungee cord I thought about making up a couple of simple latches myself, using the same carpet trim. They work really well and are practical, but have a feeling that they may cause a bruise or two as they are a touch thick. The afternoon was flying by and I needed to trim the main centre support. This was a big learning point for me, stuff is so much easier to trim outside the van. I did not get frustrated with it once, yet every other bit of trimming I have done in the van made me tense. As the evening came I decided to finish off the support with a couple of doors for the opening. 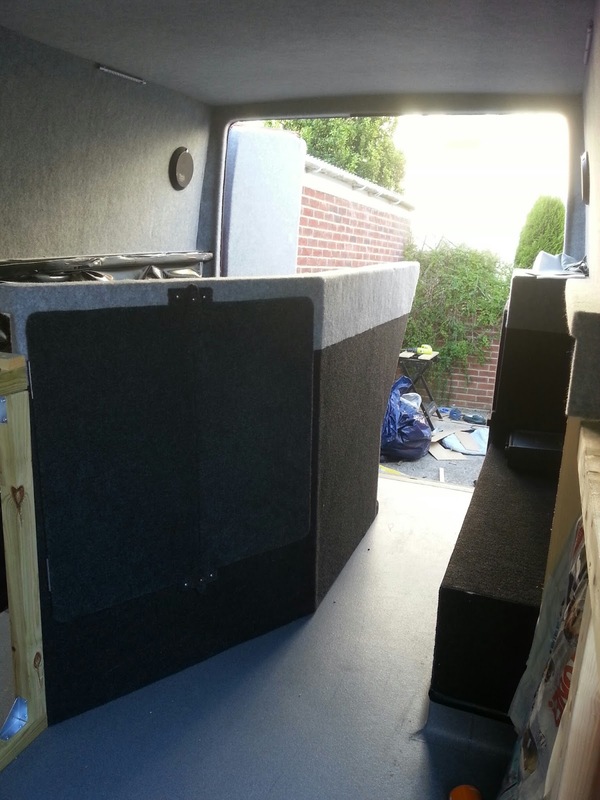 This opening will rarely be used, but is there should I need to get at stuff in the wetbox from within the van, and also to allow me to get at the gas canister to replace it, turning on and off is easily done through the kitchen cupboard. I also padded the drivers wall around the wheel arch box and gas box, then covered it with thick PVC to keep as much water away from the walls as possible. I will vent the wetbox, and plan to have some vents under the sliding window that will allow fresh air into the wet area from under the sink, obviously the rear of the area is open anyway. Maybe some wind tomorrow, maybe my back will be up to in but at the moment I need to move like an old man. Far too much sun on it today!